There is elegance in the patterns found in nature. Repeating patterns or tessellations are a part of the fabric of the visual world and can be as complex as the triangular patterns on a cone shell or as commonplace as the hexagons on a tiled floor. This website depicts several of the lifelike tessellations I have created and my artwork. Tessellations have always fascinated me. My art explores the relationship between figure and ground while telling a story with tessellations and other graphic elements. Mathematically speaking there are only seventeen groups or families that tessellate the plane, however, as an artist who has been wandering in this beautiful garden for over 30 years I have only begun to understand and appreciate the complexity and the give and take of how these figures behave. Creating tessellations is challenging, somewhat like a game of chess. These intellectual gymnastics have afforded me great amusement and enjoyment over many years. It’s a solitary creative process that few artists choose to explore; yet fun. 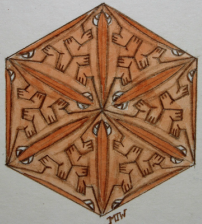 Initially the process of creating tessellations was inspired through viewing and looking at the works of M.C. Escher, however my interest has expanded dramatically with further reading about the subject and the mathematics behind their designs. I also want to thank Andrew Crompton for his keen interest and the first to bring the community together through his website “People Doing Tessellations”.